After a distraught misskicked own goal from Cresswell, his side sunk further down with Dann and Murray scoring but a consolation was scored by Enner Valencia as West Ham fell to a shocking home defeat against Crystal Palace. A small atmosphere from Palace got the two underway with West Ham starting with a passing style of play. Palace are soon coming back at West Ham, Bolasie won a corner on the left. The corner went in towards Mutch on the edge of the box, he wasted his volleyed chance. Zaha is stopped and booked for a high boot in the middle of the field. Noble’s free kick is sent down the inside on the left, Valencia and Ward tangled up. Eventually Ward stopped his opponent. Noble’s set piece, a corner, Murray nearly sored an own-goal. The second corner was put in and plucked grabbed out of the open by Speroni. A wide oppurtunity was taking to this game already. 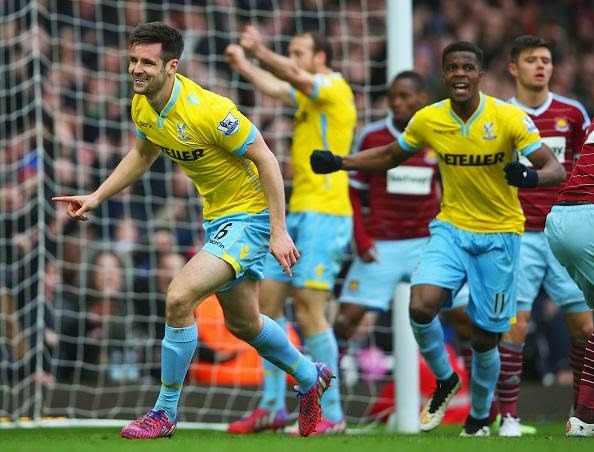 Pardew seemed disappointed as Kelly made his way down the left wing, his determined run got a corner for Palace. The corner got sent towards the far post, Dann headed over dreadfully from the right corner of the six yard box. Puncheon took down Noble, he, Valencia and Cresswell stood over the ball, Noble took battered off the crossbar and behind the goal the ball went. So unfortunate for the Hammers! The rest of the half was fouling and taking serious action in challenges between the two rivals but when Cresswell took runs he was impressing his colleagues, Manager and some spectators from both sides at the Boleyn Ground. Murray got onto the end of the corner with a header and Cresswell totally miss-kicked and it went in, not a strong header, it was a knock down, Palace scored just before the break. Cresswell own goal! 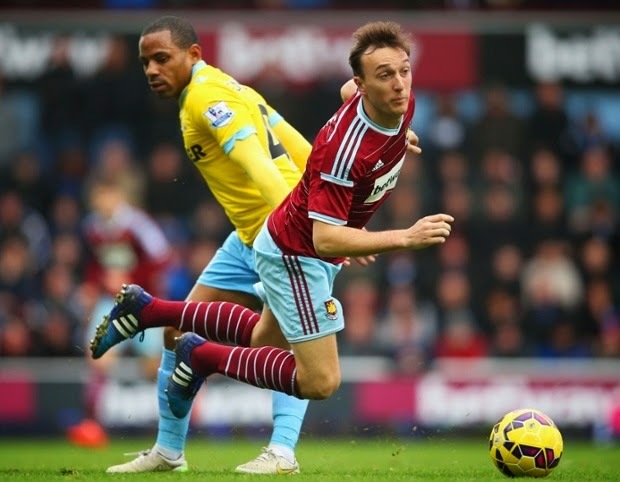 What a Catastrophy for the Hammers for the Eagles to break through on West Ham territory. Puncheon got a yellow card after a challenge on Bolasie. Half Time, and it was a one-goal advantage to the visiting underdogs. Palace took advantage and kept it well to e ahead against West Ham away and the home side could've been thre or four up at half time if it wasn't for the in-form Julian Speroni. West Ham didn't peform as well as they can in the first half. But they tried. The game got back underway and just 1 minute into the second half Winston Reid was off the field and the Hammers had 10 men, he came back on. Zaha and Bolasie covering the wings was troubling West Ham. A corner was whipped in by Murray, Reid didn't get to the ball, Dann did and he scored.Jedinak took afree kick and it only just swung too far left of the post where Adrin covered. Lots of penalty shouts in the second half but nul were given. Kouyate got a yellow after a strong challenge on Murray, Puncheon took a free kick, Murray dived, but when he dived he hit the ball intot the goal. All 3 of Palaces' goals were headers. Jenkinson swung in a cross and it went to Nene, he had a shot, it hit the post and went wide. Murray went in late on Reid and the offender who scored two goals, got sent off. After Zaha took a run he was replaced by Shola Ameobi for the reminder of the game. Downing looped the ball in but neither Valencia or Sakho got the ball. Good play down the right for the Hammers and when they thought it was over which it was, Enner Valencia tok on a shot and Speroni spilled the ball into the back of the net for a West Ham goal. Noble prodded a ball into Jenkinson, side post and then Downing hit the far post. Bolasie made way for Joe Ledley. Valencia had a 43 yard shot, it dipped at the last second and Speroni started back pedalling but he saved the shot and there was a late penalty shout ruled-out from the Hammers. West Ham still tried up to the final whistle, but Speroni was just too good and Crystal Palace beat the on-form West Ham in the Barclays Premier League. West Ham sink to Crystal Palace as an own goal from Cresswell and Murray and Dann's strike give the hosts the advantage.